Most trails in Arches National Park are short, level and easy, since the majority of the most famous arches are right next to the road. Two days would be more than sufficient to hike all of them. See the Arches map for hike locations - identified by the number. Balanced Rock is a sandstone boulder perched on a column of softer rock, beside the turn-off for the road to the Windows section. Although easily seen from the highway, a short trail loops around the formation for a closer view. 2 Broken Arch 1.4 (loop) level Starting from Devils Garden campground (site number 40) near the north end of the scenic drive, the loop path to Broken Arch also passes close to Tapestry Arch, and encounters varied scenery of rock, sand and bushes. 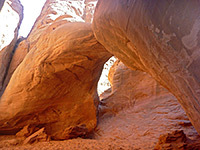 Both spans may also been seen via a longer (2.5 mile) loop hike starting from the trailhead for Sand Dune Arch. 3 Delicate Arch 1.5 480 The most famous feature in the park is reached by a moderately easy trail that starts at a gentle gradient over sandy ground then climbs more steeply up rocky slopes to the edge of a ravine next to Delicate Arch. 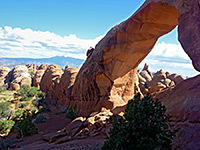 The base of the arch can be reached by walking a short distance over the slickrock. 4 Delicate Arch Viewpoint 0.25 200 For those not hiking all the way to Delicate Arch, a path to the south starts at the end of Wolfe Ranch Road and ascends moderately steeply to a viewpoint at the edge of the canyon of Winter Camp Wash, on the far side of which is the arch - about half a mile away above a sheer sandstone cliff streaked with desert varnish. 5 Devils Garden 7.5 (loop) level overall The longest trail in Arches National Park winds across slickrock and sand dunes through the largest area of arches situated away from the main road. The first 0.8 miles is graveled, and passes several large arches including Landscape, which has the widest span of all. Beyond here the route is a little rougher, and much less traveled. 6 Double Arch 0.25 level As with most paths in the national park, the trail to the twin spans of Double Arch in the Windows section is quick and easy, starting from the parking area at the end of the spur road, and reaching the arch after a level walk through bushy, sandy land beneath the cliffs. 7 Herdina Park 4 (loop) 250 Herdina Park is an isolated group of fins and ravines containing two major arches (Leaping Arch and Eye of the Whale), reached by a 4WD track. 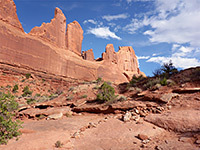 A short, unofficial trail leads to the arches, while more of the area can be seen by cross-country hiking. 8 Park Avenue 1 320 The trail closest to the park entrance encounters no major arches, but instead offers close-up views of impressive sandstone formations; Three Gossips, Tower of Babel and Sheep Rock as well as Park Avenue, all found in a larger area of eroded spires and fins known as Courthouse Towers. Each end of the route has a parking area, adjacent to the park road. 9 Sand Dune Arch 0.2 level Sand Dune is a somewhat hidden arch at the north edge of the Fiery Furnace region, reached by a short spur trail leading off the loop path to Broken Arch. 10 Skyline Arch 0.2 level Situated on top of a ridge near the north end of the scenic drive, Skyline Arch can easily be seen from the road, but the short, easy trail leading to its base offers much better views. A different, higher elevation perspective is from behind the arch, via another short path starting from Devils Garden Campground. 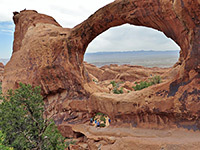 11 Tower Arch 1.5 level overall In the remote Klondike Bluffs region, the trailhead for the hike to Tower Arch is 7 miles along the dirt Salt Valley Road starting 22 miles north of Moab on US 191, then 1.5 miles west along a side track. 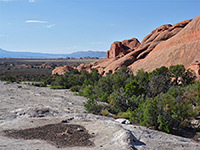 The little-used trail passes close to many colorful formations en route to the arch, which is surrounded by thick sandstone fins and spires. 12 Windows Loop 1.2 (loop) 100 The very popular loop trail at the south end of the Windows region passes 3 main arches (North Window, South Window, Turret) and affords excellent views to the east, across the Colorado River valley to the La Sal Mountains.